Sweet is what you’d expect from the voice of the JELL-O jingle, and the prominence of her sweet voice is definitely what you get on Kim DiVine’s new EP, Five. Two out of the five songs on the EP are upbeat and poppy with a base of piano and guitar that bring to mind Michelle Branch and Vanessa Carlton. “Perfect Kind of Love,” which was recently heard on CW’s One Tree Hill, adds in some interesting percussion that mixes things up a little, and the catchy and bouncy “Easy on Me” is made more so by the addition of some horns at the end. The other three songs on Five are slower and have a slight twang as they slide more onto the country side of pop. The best is “Just the Same,” the only sad song on the EP, which gives Kim a chance to show a little more depth with her gorgeous voice. 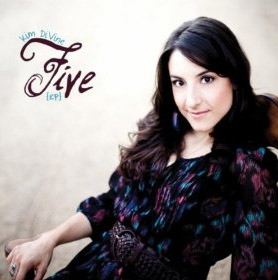 If you love female vocalists, you really need to give Kim DiVine‘s Five a listen!